This article is about the family of personal computers. For other uses, see Amiga (disambiguation). The Amiga is a family of personal computers introduced by Commodore in 1985. The original model was part of a wave of 16- and 32-bit computers that featured 256 KB or more of RAM, mouse-based GUIs, and significantly improved graphics and audio over 8-bit systems. This wave included the Atari ST—released the same year—Apple's Macintosh, and later the Apple IIGS. Based on the Motorola 68000 microprocessor, the Amiga differed from its contemporaries through the inclusion of custom hardware to accelerate graphics and sound, including sprites and a blitter, and a pre-emptive multitasking operating system called AmigaOS. The Amiga 500 (1987) was the best selling model. The Amiga 1000 was released in July 1985, but a series of production problems kept it from becoming widely available until early 1986. The best selling model, the Amiga 500, was introduced in 1987 and became one of the leading home computers of the late 1980s and early 1990s with four to six million sold. The A3000, introduced in 1990, started the second generation of Amiga systems, followed by the A500+, and the A600 in March 1992. Finally, as the third generation, the A1200 and the A4000 were released in late 1992. The platform became particularly popular for gaming and programming demos. It also found a prominent role in the desktop video, video production, and show control business, leading to video editing systems such as the Video Toaster. The Amiga's native ability to simultaneously play back multiple digital sound samples made it a popular platform for early tracker music software. The relatively powerful processor and ability to access several megabytes of memory enabled the development of several 3D rendering packages, including LightWave 3D, Imagine, Aladdin4D, TurboSilver and Traces, a predecessor to Blender. 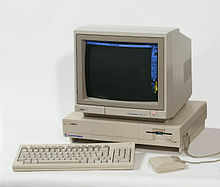 Although early Commodore advertisements attempt to cast the computer as an all-purpose business machine, especially when outfitted with the Amiga Sidecar PC compatibility add-on, the Amiga was most commercially successful as a home computer, with a wide range of games and creative software. Poor marketing and the failure of the later models to repeat the technological advances of the first systems meant that the Amiga quickly lost its market share to competing platforms, such as the fourth generation game consoles, Macintosh, and the rapidly dropping prices of IBM PC compatibles which gained 256-color VGA graphics in 1987. Commodore ultimately went bankrupt in April 1994 after the Amiga CD32 model failed in the marketplace. The Amiga was so far ahead of its time that almost nobody—including Commodore's marketing department—could fully articulate what it was all about. Today, it's obvious the Amiga was the first multimedia computer, but in those days it was derided as a game machine because few people grasped the importance of advanced graphics, sound, and video. Nine years later, vendors are still struggling to make systems that work like 1985 Amigas. With the 8-bit line's launch in 1979, the team once again started looking at a next generation chipset. Nolan Bushnell had sold the company to Warner Communications in 1978, and the new management was much more interested in the existing lines than development of new products that might cut into their sales. Miner wanted to start work with the new Motorola 68000, but management was only interested in another 6502 based system. Miner left the company, and, for a time, the industry. A breadboard prototype was largely completed by late 1983, and shown at the January 1984 Consumer Electronics Show (CES). At the time, the operating system was not ready, so the machine was demonstrated with the Boing Ball demo. A further developed version of the system was demonstrated at the June 1984 CES and shown to many companies in hopes of garnering further funding, but found little interest in a market that was in the final stages of the North American video game crash of 1983. In March, Atari expressed a tepid interest in Lorraine for its potential use in a games console or home computer tentatively known as the 1850XLD. But the talks were progressing slowly, and Amiga was running out of money. A temporary arrangement in June led to a $500,000 loan from Atari to Amiga to keep the company going. The terms required the loan to be repaid at the end of the month, otherwise Amiga would forfeit the Lorraine design to Atari. During 1983, Atari lost over $1 million a week, due to the combined effects of the crash and the ongoing price war in the home computer market. By the end of the year, Warner was desperate to sell the company. In January 1984, Jack Tramiel resigned from Commodore due to internal battles over the future direction of the company. A number of Commodore employees followed him to his new company, Tramiel Technology. This included a number of the senior technical staff, where they began development of a 68000-based machine of their own. In June, Tramiel arranged a no-cash deal to take over Atari, reforming it as Atari Corporation. As many Commodore technical staff had moved to Atari, Commodore was left with no workable path to design their own next-generation computer. The company approached Amiga offering to fund development as a home computer system. They quickly arranged to repay the Atari loan, ending that threat. The two companies were initially arranging a $4 million license agreement before Commodore offered $24 million to purchase Amiga outright. The system was enclosed in a pizza box form factor case; a late change was the introduction of vertical supports on either side of the case to provide a "garage" under the main section of the system where the keyboard could be stored. The first model was announced in 1985 as simply "The Amiga from Commodore", later to be retroactively dubbed the Amiga 1000. [a] They were first offered for sale in August, but by October only 50 had been built, all of which were used by Commodore. Machines only began to arrive in quantity in mid-November, meaning they missed the Christmas buying rush. By the end of the year, they had sold 35,000 machines, and severe cashflow problems made the company pull out of the January 1986 CES. Bad or entirely missing marketing, forcing the development team to move to the east coast, notorious stability problems and other blunders limited sales in early 1986 to between 10,000 and 15,000 units a month. All Amiga systems can display full-screen animated graphics with 2, 4, 8, 16, 32, 64 (EHB Mode), or 4096 colors (HAM Mode). Models with the AGA chipset (A1200 and A4000) also have non-EHB 64, 128, 256, and 262144 (HAM8 Mode) color modes and a palette expanded from 4096 to 16.8 million colors. The mouse has two buttons like Windows, but unlike Windows pressing and holding the right button replaces the system status line at the top of the screen with a Maclike menu bar. As with Apple's Mac OS prior to Mac OS 8, menu options are selected by releasing the button over that option, not by left clicking. Menu items that have a boolean toggle state can be left clicked whilst the menu is kept open with the right button, this allows the user - for example - to set some selected text to bold, underline and italics all at once. In the North American market, the NewTek Video Toaster was a video effects board which turned the Amiga into an affordable video processing computer which found its way into many professional video environments. One well-known use was to create the special effects in early series of Babylon 5. Due to its NTSC-only design, it did not find a market in countries that used the PAL standard, such as in Europe. In those countries, the OpalVision card was popular, although less featured and supported than the Video Toaster. Low-cost time base correctors (TBC) specifically designed to work with the Toaster quickly came to market, most of which were designed as standard Amiga bus cards. A1010 floppy disk drive - consists of a 3.5-inch double density (DD), 300 rpm, 250 kbit/s drive unit connected via DB-23 connector; track-to-track delay is on the order of ~94 ms. The default capacity is 880 KB. Many clone drives were available, and products such as the Catweasel and KryoFlux make it possible to read and write Amiga and other special disc formats on standard x86 PCs. The Commodore A2232 board provides seven RS-232C serial ports in addition to the Amiga's built-in serial port. Each port can be driven independently at speeds of 50 to 19,200 bits/s. There is however a driver available on Aminet that allows two of the serial ports to be driven at 115 200 bits/s. The serial card used the 65CE02 CPU clocked at 3.58 MHz. This CPU was also part of the CSG 4510 CPU core that was used in the Commodore 65 computer. The Amiga 1000 (1985) was the first model released. The Amiga 4000 (1992) was the last desktop computer made by Commodore. The first Amiga model, the Amiga 1000, was launched in 1985. In 2006, PC World rated the Amiga 1000 as the seventh greatest PC of all time, stating "Years ahead of its time, the Amiga was the world's first multimedia, multitasking personal computer". Commodore updated the desktop line of Amiga computers with the Amiga 2000 in 1987, the Amiga 3000 in 1990, and the Amiga 4000 in 1992, each offering improved capabilities and expansion options. However, the best selling models were the budget models, particularly the highly successful Amiga 500 (1987) and the Amiga 1200 (1992). The Amiga 500+ (1991) was the shortest lived model, replacing the Amiga 500 and lasting only six months until it was phased out and replaced with the Amiga 600 (1992), which in turn was also quickly replaced by the Amiga 1200. Commodore's last Amiga offering before filing for bankruptcy was an attempt to capture a portion of the highly competitive 1990s console market with the Amiga CD32 (1993), a 32-bit CD-ROM games console. Although discontinued after Commodore's demise it met with moderate commercial success in Europe. The CD32 was a next generation CDTV, and it was designed to save Commodore by entering the growing video game console market. Several Amiga models contained references to songs by the rock band The B-52's. Early A500 units had the words "B52/ROCK LOBSTER" silk-screen printed onto their printed circuit board, a reference to the song "Rock Lobster" The Amiga 600 referenced "JUNE BUG" (after the song "Junebug") and the Amiga 1200 had "CHANNEL Z" (after "Channel Z")., and the CD-32 had "Spellbound." Long-time Amiga developer MacroSystem entered the Amiga-clone market with their DraCo non-linear video editing system. It appears in two versions, initially a tower model and later a cube. 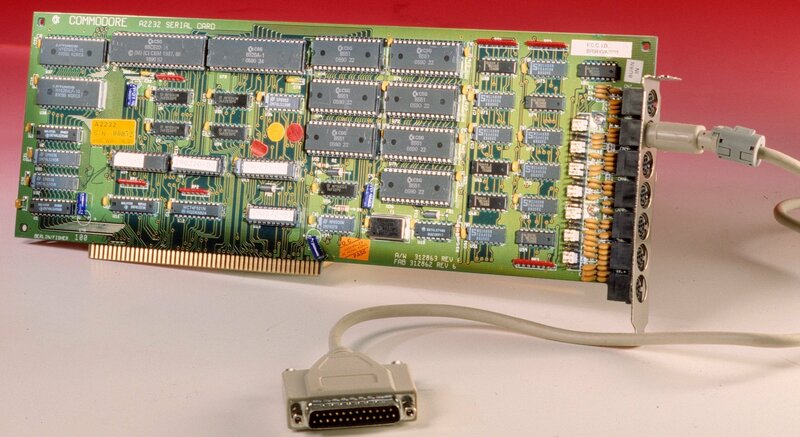 DraCo expanded upon and combined a number of earlier expansion cards developed for Amiga (VLabMotion, Toccata, WarpEngine, RetinaIII) into a true Amiga-clone powered by the Motorola 68060 processor. The DraCo can run AmigaOS 3.1 up through AmigaOS 3.9. It is the only Amiga-based system to support FireWire for video I/O. DraCo also offers an Amiga-compatible Zorro-II expansion bus and introduced a faster custom DraCoBus, capable of 30 MB/sec transfer rates (faster than Commodore's Zorro-III). The technology was later used in the Casablanca system, a set-top-box also designed for non-linear video editing. In 2006, two new Amiga clones were announced, both using FPGA based hardware synthesis to replace the Amiga OCS custom chipset. The first, the Minimig, is a personal project of Dutch engineer Dennis van Weeren. Referred to as "new Amiga hardware", the original model was built on a Xilinx Spartan-3 development board, but soon a dedicated board was developed. The minimig uses the FPGA to reproduce the custom Denise, Agnus, Paula and Gary chips as well as both 8520 CIAs and implements a simple version of Amber. The rest of the chips are an actual 68000 CPU, ram chips, and a PIC microcontroller for BIOS control. The design for Minimig was released as open-source on July 25, 2007. In February 2008, an Italian company Acube Systems began selling Minimig boards. A third party upgrade replaces the PIC microcontroller with a more powerful ARM processor, providing more functionality such as write access and support for hard disk images. The Minimig core has been ported to the FPGArcade "Replay" board. The Replay uses an FPGA with about 3 times more capacity and which does support the AGA chipset and a 68020 soft core with 68030 capabilities. The Replay board is designed to implement many older computers and classic arcade machines. "[AmigaOS] remains one of the great operating systems of the past 20 years, incorporating a small kernel and tremendous multitasking capabilities the likes of which have only recently been developed in OS/2 and Windows NT. The biggest difference is that the AmigaOS could operate fully and multitask in as little as 250 K of address space. —  John C. Dvorak, PC Magazine, October 1996. AmigaOS does not implement memory protection, because the 68000 CPU does not include a memory management unit. Although this speeds and eases inter-process communication because programs can communicate by simply passing a pointer back and forth, the lack of memory protection made the AmigaOS more vulnerable to crashes from badly behaving programs than other multitasking systems that did implement memory protection, and Amiga OS is fundamentally incapable of enforcing any form of security model since any program had full access to the system. A co-operational memory protection feature was implemented in AmigaOS 4 and could be retrofitted to old AmigaOS systems using Enforcer or CyberGuard tools. AmigaOS directly or indirectly inspired the development of various operating systems. MorphOS and AROS clearly inherit heavily from the structure of AmigaOS as explained directly in articles regarding these two operating systems. AmigaOS also influenced BeOS, which featured a centralized system of Datatypes, similar to that present in AmigaOS. Likewise, DragonFly BSD was also inspired by AmigaOS as stated by Dragonfly developer Matthew Dillon who is a former Amiga developer. WindowLab and amiwm are among several window managers for the X Window System seek to mimic the Workbench interface. IBM licensed the Amiga GUI from Commodore in exchange for the REXX language license. This allowed OS/2 to have the WPS (Work Place Shell) GUI shell for OS/2 2.0 a 32-bit operating system. The first official Amiga logo was a rainbow-colored double check mark. In later marketing material Commodore largely dropped the checkmark and used logos styled with various typefaces. Although it was never adopted as a trademark by Commodore, the "Boing Ball" has been synonymous with Amiga since its launch. It became an unofficial and enduring theme after a visually impressive animated demonstration at the 1984 Winter Consumer Electronics Show in January 1984 showing a checkered ball bouncing and rotating. Following Escom's purchase of Commodore in 1996, the Boing Ball theme was incorporated into a new logo. Amiga Kit Amiga Store, Vesalia Computer and ASB Computer sell numerous items from aftermarket components to refurbished classic systems. After Commodore went bankrupt in 1994, an active Amiga community continued to support the platform long after mainstream commercial vendors abandoned it. The most popular Amiga magazine, Amiga Format, continued to publish editions until 2000, some six years after Commodore filed for bankruptcy. Another magazine, Amiga Active, was launched in 1999 and was published until 2001. In spite of declining interest in the platform, there was a bi-weekly specialist column in the UK weekly magazine Micro Mart. Several notable magazines are in publication today: Amiga Future, which is available in both English and German; Bitplane.it, a bi-monthly magazine in Italian; and AmigaPower, a long-running French magazine. Electronic musician Max Tundra created his three albums with an Amiga 500. Amigas were used in various NASA laboratories to keep track of low orbiting satellites, and were still used until 2004 (but eventually discontinued and sold in 2006). Amigas were used at Kennedy Space Center to run strip-chart recorders, to format and display data, and control stations of platforms for Delta rocket launches. As of 2015[update], the Grand Rapids Public School district still uses a Commodore Amiga 2000 computer, complete with 1200 baud modem, to automate its air conditioning and heating systems for the 19 schools covered by the GRPS district. "The system controls the start/stop of boilers, the start/stop of fans, pumps, [it] monitors space temperatures, and so on." The system has been running day and night for decades. ^ The name "Amiga" was chosen because it is the Spanish word for (female) friend, and alphabetically it appears before Apple in lists of computer makers. It originated as a project code-named "Lorraine", therefore the female was used instead of the male and general version Amigo. ^ a b Jeremy Reimer. "Total share: 30 years of personal computer market share figures". Ars Technica. Archived from the original on April 21, 2008. Retrieved April 21, 2008. ^ a b "Amiga TV Advert (Celebrity)". YouTube. 2007-01-07. Retrieved 2012-08-24. ^ Reimer, Jeremy (3 July 2007). "A history of the Amiga, part 1: Genesis". Ars Technica. ^ a b c Reimer, Jeremy (3 July 2007). "A history of the Amiga, part 1: Genesis". Ars Technica. ^ a b Gareth Knight. "Amiga Lorraine". Amiga History Guide. Retrieved April 21, 2008. ^ "Amiga Games". Amiga Forever. Retrieved 2012-08-24. ^ a b Reimer, Jeremy (21 August 2007). "A history of the Amiga, part 3: The first prototype". Ars Technica. ^ a b Reimer, Jeremy (10 December 2007). "A history of the Amiga, part 4: Enter Commodore". Ars Technica. ^ Reimer, Jeremy (21 October 2007). "A history of the Amiga, part 5: postlaunch blues". Ars Technica. ^ a b Reimer, Jeremy (11 February 2008). "A history of the Amiga, part 6: stopping the bleeding". Ars Technica. ^ Knight, Gareth. "Commodore-Amiga Sales Figures". Amiga history guide. Archived from the original on 2018-09-27. Retrieved 2019-01-20. ^ "The Next Generation 1996 Lexicon A to Z". Next Generation. No. 15. Imagine Media. March 1996. pp. 29–30. ^ Reimer, Jeremy (28 April 2013). "A history of the Amiga, part 8: The demo scene". Ars Technica. ^ a b Commodore-Amiga, Inc. (1991). Amiga Hardware Reference Manual. Amiga Technical Reference Series (3rd ed.). Addison-Wesley. ISBN 0-201-56776-8. ^ Knight, Gareth. "The One for 16-bit Games". Amiga History Guide. Archived from the original on July 12, 2007. Retrieved July 17, 2007. ^ "Amiga Reviews: Zzap 16-Bit Gaming". Archived from the original on May 12, 2008. Retrieved May 23, 2008. ^ Dave Haynie (1995-01-24). "CBM's Plans for the RISC-Chipset". Gareth Knight. Retrieved January 31, 2010. The initial schedule of 18 months was for the Hombre game machine hardware. There's no real OS here, just a library of routines, including a 3D package, which would probably be licensed. The Amiga OS was not to have run on this system in any form. ^ "Commodore: A2024". Amiga-hardware.com. Archived from the original on March 2, 2012. Retrieved January 31, 2012. ^ Anderson, Rhett (October 1987). "Close Up: The Amiga 500". Compute!. pp. 16–19. Retrieved 18 January 2015. ^ "Amiga goes POWER PC (TM)". ^ "CGI first introduced to TV in Babylon 5 by MIT presentor [sic]". geek.com. ^ "Diskdrives used by Commodore". amiga-stuff.com. December 12, 2003. Retrieved January 31, 2012. ^ "PCMCIA Network Card driver". ^ a b "Big Book of Amiga Hardware - Commodore: A2232". bboah.com. 2009-01-25. Retrieved 2013-06-21. ^ "a2232_big.jpg". bboah.com. 2008-08-01. Archived from the original on 2013-11-04. Retrieved 2013-06-21. ^ Knight, Gareth (1997–2003). "Amiga history guide". Retrieved September 29, 2007. ^ Gareth Knight (1993-12-31). "Commodore-Amiga Sales Figures". Amigahistory.co.uk. Retrieved 2012-08-24. ^ Editors, The (August 12, 1981). "PC World, The 25 Greatest PCs of All Time". Pcworld.com. Retrieved January 31, 2012. ^ Gareth Knight (July 1, 2004). "Commodore Amiga 500". Amigahistory.co.uk. Retrieved January 31, 2012. ^ Knight, Gareth (1997–2006). "References to B52 songs on Amiga Motherboards". Retrieved May 20, 2008. ^ "AmigaOS 4.0 The Final Update available". Hyperion-entertainment.biz. 2006-12-24. Retrieved 2012-08-24. ^ "AmigaOS 4.0 for Classic Amiga gone Gold". Hyperion-entertainment.biz. 2007-11-22. Retrieved 2012-08-24. ^ "AmigaOS 4.1 gone Gold". Hyperion-entertainment.biz. 2008-08-06. Retrieved 2012-08-24. ^ Staff, Ars (2008-09-23). "It's alive! : Ars reviews AmigaOS 4.1". Ars Technica. Retrieved 2012-08-24. ^ "AmigaOS 4.1 for Classics imminent". Hyperion-entertainment.biz. 2011-05-11. Retrieved 2012-08-24. ^ "AmigaOS 4.1 Update 5 Released « Hyperion Entertainment Blog". Blog.hyperion-entertainment.biz. 2012-08-16. Retrieved 2012-08-24. ^ "AmigaOS 4.1 for Pegasos II, Hyperion Entertainment, The Amiga Computer Community Portal Website". Amigaworld.net. 2009-01-31. Retrieved 2012-08-24. ^ "MacroSystem (US & Germany): DraCo". Amiga-hardware.com. Archived from the original on 2012-12-12. Retrieved 2012-08-24. ^ "Выпущен прототип новой модели компьютеров Amiga (ФОТО)" (in Russian). Российское информационное агентство «Новый Регион». Версия 2.0. Feb 13, 2011. Retrieved June 24, 2011. ^ "12 questions to... Natami Team — part 1". Polski Portal Amigowy. April 28, 2011. Retrieved June 15, 2011. ^ a b "HetNet.nl". Home.hetnet.nl. Retrieved January 31, 2012. ^ "INDIVIDUAL COMPUTERS [ jens schoenfeld ]". Siliconsonic.de. Archived from the original on 2012-03-04. Retrieved 2012-01-31. ^ ""Minimig available" announcement by Acube Systems" (in Italian). Acube-systems.biz. Retrieved January 31, 2012. ^ Mical, Robert J.; Deyl, Susan (1987). Amiga Intuition Reference Manual. Amiga Technical Reference Series. Addison-Wesley Publishing Company, Inc. ISBN 0-201-11076-8. ^ Sassenrath, Carl (1986). Amiga ROM Kernel Reference Manual. Exec. ^ Holloway, Tim (January 1991). "The Object-Oriented Amiga Exec: The design of the Amiga operating-system kernel follows the rules of object-oriented programming". Byte. McGraw-Hill (January 1991): 329–332, 234. ISSN 0360-5280. ^ "Adding Memory Protection (MP) to the Amiga". groups.google.com. Retrieved December 30, 2006. ^ Tech Book 1 - Published articles Oct 2006 - June 2008 - Michael Reed - Google Boeken. Books.google.com. Retrieved 2013-07-24. ^ Matthew Dillon (2006-02-28). "DragonFly kernel List (threaded) for 2006-02, Re: User-Space Device Drivers". Leaf.dragonflybsd.org. Retrieved 2008-02-01. ^ Matthew Dillon (2003-07-17). "DragonFly kernel List (threaded) for 2003-07, Re: You could do worse than Mach ports". Leaf.dragonflybsd.org. Retrieved 2008-02-01. ^ Doug McIlroy. "OS/2 Eric S. Raymond Operating System Comparisons The Art of Unix Programming". Catb.org. Retrieved 2013-07-24. ^ "Minix". CompWisdom. Retrieved 2012-08-24. ^ Gareth Knight. "The Twists and Turns of the Amiga Saga". Amiga History Guide. Archived from the original on May 11, 2008. Retrieved April 21, 2008. ^ Ryan Czerwinski (December 31, 2001). "Dr. Ryan Czerwinski of Merlancia Industries explains the origin of the Amiga Boing ball and checkmark". Amiga Network News. Retrieved November 21, 2010. ^ "AROS68k". AROS68k. Archived from the original on 2012-11-07. Retrieved 2012-08-24. ^ Andreas Magerl. "Amigafuture.de". Amigafuture.de. Retrieved January 31, 2012. ^ "Bitplane.it" (in Italian). Bitplane.it. Retrieved January 31, 2012. ^ "Amigapower.free.fr". Amigapower.free.fr. Retrieved January 31, 2012. ^ "The Lurker's Guide to Babylon 5". Midwinter.com. August 12, 1997. Retrieved January 31, 2012. ^ An Interview with Ron Thornton, October 16, 1995. "Effects are designed on an accelerated Amiga 2000 with a Video Toaster board in it, using LightWave 3-D and Modeler 3-D". ^ "'Max Headroom' on TechTV". G4tv.com. April 23, 2002. Retrieved January 31, 2012. ^ Gareth Knight (2002-02-23). "Welcome to Famous Amiga Uses! By Pär Boberg 2000-2002". Amigahistory.co.uk. Retrieved 2012-08-24. ^ "Amiga Andy article". Artnode online. Archived from the original on 2006-10-03. Retrieved 2006-12-05. ^ "Artdaily article about the discovery and repair of "you are the one"". Artdaily. Archived from the original on February 20, 2007. Retrieved January 7, 2007. ^ "Interview with Andy Warhol" (PDF). Amiga World Magazine. Archived from the original (PDF) on 2007-02-02. Retrieved January 7, 2007. ^ Goodman, Cynthia (1990). "The Digital Revolution: Art in the Computer Age". Art Journal. 49 (3): 248–252. doi:10.2307/777115. JSTOR 777115. ^ "Calvin Harris". June 6, 2007. Retrieved August 10, 2008. ^ Masuda, Junichi. "HIDDEN POWER of masuda". GameFreak. Retrieved 7 November 2013. ^ "Reportage: l'Amiga à la NASA". obligement.free.fr. ^ "''Even NASA used Amigas'' on YouTube". Youtube.com. 2012-09-05. Retrieved 2013-07-24. ^ "Info magazine issue 13". ^ Gareth Knight. "CD32: The Hyper-Museum Project". Amigahistory.co.uk. Retrieved January 31, 2012. ^ "American Laser Games Tech Center". Dragon's Lair Project. Archived from the original on January 29, 2009. Retrieved January 23, 2009. ^ "United States Patent Application 20070106157". Archived from the original on 2015-07-13. ^ Eric Limer (June 12, 2015). "One Ancient Commodore Amiga Runs the Heat and AC for 19 Public Schools". Hearst Digital Media. Retrieved June 15, 2015. ^ "1980s computer controls GRPS heat and AC". Wikimedia Commons has media related to Commodore Amiga.